A great conservative thinker (Burke) once said of another, “Who now reads Bolingbroke? Who ever read him through?” For context, Burke was referring specifically to Lord Bolingbroke’s posthumous philosophical writings, which, it is true, are not much read or indeed worth reading. But his political writings are another matter, which I perhaps shall expand upon in some future post. I would apply Burke’s assessment of Bolingbroke’s reputation to another great conservative thinker, though perhaps with more justification: Who now reads Filmer? Who ever read him through? 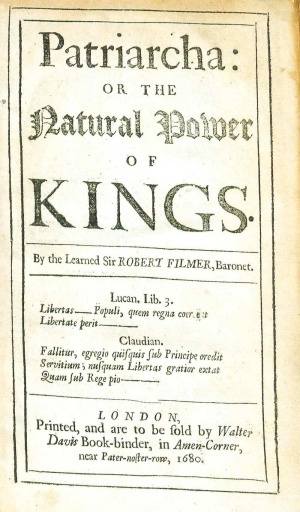 Sir Robert Filmer (1588-1653) is best known today, if known at all, as the author whom John Locke attacked in his Two Treatises of Government (1689) for his supposedly crackpot views on the divine right of Kings having been derived from Adam through the Old Testament patriarchs. I was forced to read Locke’s Two Treatises in university, but I was never made to read Filmer. Had I done so, I would have discovered that the latter serves as a straw man for the former. My Whiggish educators would not have allowed that to happen, especially had any of them read Filmer themselves, which I suspect they hadn’t. So inconsequential is Filmer considered, that he doesn’t warrant an entry in the Stanford Encyclopedia of Philosophy. Philosophical reputation can be a faddish thing. It is very much subject to the pressing concerns and fickle fancies of each generation of philosophers. There was a time when David Hume was considered to be a historian. If recognized at all as a philosopher, it was as one that was bad, mad, and dangerous to know. At the same time, Thomas Reid was considered to be a philosopher’s philosopher who spawned an extremely influential school (Scottish Common Sense philosophy). There was at that time no “Humean School” to speak of. As the English-speaking world became more skeptical, less deferential to authority, more inclined to scoff at moral and religious claims to truth, more immoral (or at least amoral), Hume’s star rose and Reid’s fell. And yet, for we happy few who have taken the time to read and engage with Reid’s thought, we might wonder whence this neglect of Hume’s great contemporary. Sometimes philosophy may hold an unflattering mirror up to society. But more often, society simply chooses the philosophical mirror it prefers to see itself reflected in. In modern times we have tended to choose very Whiggish mirrors. Given the lapse of time between Filmer’s death and the critiques of Locke and Sidney, it should be noted that the latter were writing to a different generation, with different political concerns. While Filmer wrote in the context of the English Civil War, Sidney’s Discourses concerning Government (also published posthumously) was written during the Exclusion Crisis, as part of a campaign to keep the Catholic James, Duke of York from succeeding his brother on the English throne. Locke’s Two Treatises (1689) was published during the so-called “Glorious Revolution” that replaced James II (the aforementioned Catholic Duke of York) with his daughter Mary and her Dutch husband William III. Actually, Locke’s work was written earlier, during the Exclusion Crisis. As Peter Laslett, Locke’s greatest editor, convincingly argued, “Two Treatises is an Exclusion Tract, not a Revolution Pamphlet” (p. 61). In any case, whether these were Exclusion or Revolution tracts, they were trying roughly to achieve the same thing: delegitimize the (hereditary) Stuart claim to the throne by attacking a prominent defender of it. 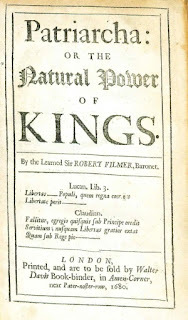 Filmer is portrayed by Locke and Sidney as rather a ridiculous figure, a slightly cretinous old reactionary with crack-brained ideas about the King being God’s anointed through descent from Adam. That portrayal has essenitally continued to this day. In a review of a then-new edition of Filmer’s works, Christopher Hill, eminent 20th-century Marxist historian of the English Civil War period, cannot help making a snide little jab at Filmer (and Tories in general) when he wrote that “Filmer’s theory was the best the Tories could produce in the decisive decade 1678-88.” Again, it seems we’re meant to save ourselves the trouble of reading something not worth reading. Hill’s words paper over the fact that through that same decade the Whigs hadn’t fared much better; they too stooped to grave-digging, resurrecting long-dead authors to support their cause. Philip Hunton’s A Treatise of Monarchy (1643) comes to mind, which was reprinted in 1689, not long after Filmer’s works had been reissued. Entering this pair in the lists was ironic, for they had done battle previously: Hunton’s Treatise had already been ably answered by Filmer’s Anarchy years before. It seems both sides were scavenging old ideas to support their respective causes, as is attested by the outpouring of reprints of Civil War-era works on similar themes that were reprinted during the Exclusion Crisis and the "Glorious" Revolution (a large selection of which can be found scattered in the pages of the Harleian Miscellany, for those who are interested). Thomas Hobbes had also strenuously defended monarchy, though on different grounds than Filmer. However, Hobbes was also a notorious infidel, and could therefore be safely ignored by most in the 1680s. Indeed, some of his ideas – e.g. natural liberty in an original state of nature, the institution of government by contractual consent – had already been co-opted by the Whigs for their purposes, so that by a strange sublimation, what had been arguments for absolutism became the very core of liberal theory. Unlike Hobbes, Filmer was no outsider; he was a member of the landed gentry and he was an orthodox religionist who went out of his way to attack the infidel Hobbes. He was therefore taken up by clergymen in a way that Hobbes could not be. So every Sunday from pulpits across the land, the laity were being instructed by High Church preachers in the virtues of passive obedience to a monarchy instituted and sanctioned by God. Reading between the lines, one gets the impression that the Whigs felt they were losing the battle for hearts and minds. I suspect they were. But you’d never know it from the Whiggish triumphalism suffusing modern accounts of the Locke-Filmer debate. When I read Locke’s Two Treatises, I sense that the author’s seeming contempt is masking palpable ideological fear. I contend that Locke and Sidney misunderstand (willfully?) Filmer’s point. Filmer wasn’t claiming that Charles I literally derived his power from the biblical patriarchs. He was merely making the point that political obligation, specifically obligation to a monarch, was a basic anthropological phenomenon that pre-existed any supposed compact or agreement among the political community. Subjection to authority is and has always been a natural state, into which each of us is born; it is most commonly found in the subjection of child to parent, and forms our earliest “political” experience. (Note too, that unlike the Whiggish view of political subjection, this natural relationship is not based solely – or even mostly – on an implicit threat of violence.) The supposed Hobbesian/Lockean “natural freedom” in a state of nature, on the other hand, is mere fiction. Hence, writes Filmer, “Where subjection of children to parents is natural, there can be no natural freedom” (The Anarchy, p. 142). We do not spring up like mushrooms in the night, as fully-formed isomorphic liberal selves. Now this claim, that political authority is conceptually or analogously related to parental authority, is one that might be argued against on historical/factual grounds, but it is not an absurd or lunatic claim. The fact is, we each of us is born under authority, and we rarely question its legitimacy. So why are we so quick to question the legitimacy of existing political authority, especially in the form of a monarchy which had existed since time immemorial? Why the need to replace this common experience with an abstract and likely fictional account of an original social contract? It is ironic that, while Filmer was attacking the theorizing of Hobbes and others, who based political obligation upon a supposed social contract, Locke attempts to refute Filmer by offering — a social contract theory! Filmer was not alone in criticizing as a whimsical fiction this social contract view of the origins of political obedience. One of Locke’s antagonists, the underrated Edward Stillingfleet (1635-1699), Bishop of Worcester, made a similar point, writing “Every new modeller of government hath something to offer that looks like reason, at least to those whose interest it is to carry it on: and, if no precedents can be found, then they appeal to a certain invisible thing called, The Fundamental Contract of the Nation, which, being no where to be found, may signify what any one pleaseth” (quoted in Hatsell, Vol. II, p. 72). As already noted, it was in part the later preaching of Filmerian doctrine from the pulpits by clergyman such as Stillingfleet that spurred Locke to write his Two Treatises. But contrary to prevailing prejudices, it was not just clergyman and High Church Tories who were skeptical of Whiggish social contract doctrines. Chief Justice Matthew Hale (1609-1676), no High Church clergyman, and someone respected by Whig and Tory alike, wrote of England that “the original pact whereby this kingdom was settled appears not, neither have we reason to believe there was any extant, it having been so ancient a kingdom… and therefore should we make our estimate of the nature and extent of the government by that, we should be at a loss” (p. 8). So at least some of Filmer’s doctrines were establishment rather than fringe ideas, contrary to how Filmer’s legacy is portrayed by today’s Whiggish scholars. I implied above that Locke and Sidney willingly misunderstood Filmer. First, as mentioned, they mostly chose to criticize one work, the posthumous Patriarcha. Secondly, they chose to overemphasize and mischaracterize the notion that the monarch’s authority is an estate handed down from the biblical patriarchs, who derived it from Adam. The edition of Patriarcha I have is 64 pages long. Only one part of the first chapter, a passage totaling about 9 pages, contains what is commonly supposed to be his central tenet, that monarchy is derived from the paternal authority of the Old Testament patriarchs and ultimately from Adam. There is as much Roman as there is Old Testament history in the work, and there is more English constitutional history than either (roughly 20 pages). Indeed, Filmer demonstrates a much deeper knowledge of English constitutional history and precedent than either Sidney or Locke. In this regard, I find Locke in particular appallingly ignorant of the constitutional law and customs of his own country. This is not atypical of philosophers, who rarely let facts stand in the way of a good theory. Stillingfleet’s words, quoted above, are instructive here: Locke is one of those “new modellers” of government who, lacking precedents (largely due to his legal-constitutional ignorance), appeals to a fictional contract, which serves as the black box for whatever preconceived theory he wishes to pull out of it. There is a grain of truth to this claim, for it certainly is interesting that different social contract theorists manage to generate vastly different ideal political systems from the same basic theoretical machinery. Locke’s ideal commonwealth is radically different from Hobbes’, Hobbes’ is radically different from Rousseau’s, and Rawls’ is vastly different from Nozick’s. What all of them do have in common is a readiness to make vast quasi-anthropological claims on pretty thin empirical grounds (though to be fair, Filmer is guilty of this too). In his use of constitutional history and precedent, Filmer has been accused of unoriginality, relying heavily on other sources. If so, then it merely shows that better minds than his were already thinking along the same lines about monarchy, sovereignty, and political authority. For example, one of Filmer’s sources was the antiquarian Sir Robert Cotton (1571-1631). In a short and accessible posthumous work, The Antiquity and Dignity of Parliaments (again, one of those earlier unpublished works that was dug up and published in 1679), Cotton presents a comprehensive range of precedents, in chronological order. They are all marshalled to show very convincingly that the inclusion of the commons in Parliament was a relatively recent development, and that Parliament was always intended to be no more than an advisory body to the King, summoned and dissolved at his pleasure. The King was placed in a position above the law, his sovereignty undivided. This is essentially Filmer’s view of the matter, and The Free-holders Grand Inquest could have been written by Cotton. The cartoonish Whig depiction of Filmer, as a crazed or semi-retarded old religious zealot, whose defense of his King relies mostly or solely on Old Testament patriarchy, goes back a lot further than Locke and Sidney. Just a few years after Filmer’s death, we find Marchamont Nedham writing that “Those Men that deny this Position [that the origin of legitimate government rests with the people], are fain to run up as high as Noah and Adam, to gain a pretence for their Opinion: alledging, That the primitive or first Governments of the World were not instituted by the consent and election of those that were governed” (The Excellencie of a Free-State (1656), p. 70). Nedham was writing before Patriarcha was published. His editor, Blair Worden, believes that the reference is to Filmer’s The Anarchy of a Limited or Mixed Monarchy (1648). Assuming so, then just as with Filmer’s Whig critics a quarter of a century later, Nedham’s characterization of his argument’s reliance on Old Testament patriarchy is absurdly overblown. The edition of The Anarchy I have in my hand is forty pages long. Of that, passages reliant on biblical history, taken together, account for roughly two pages. Classical and contemporary references vastly outnumber scriptural ones. Indeed, if Filmer’s Anarchy was so reliant on Scripture, one would expect him to have chosen a verse or two of Scripture for his epigraph. Instead, he chose a couple of lines from Lucan’s Pharsalia. Nedham seems to have been a man of rather flexible political convictions; he held them strongly and eloquently, but only until it was no longer in his interest to hold them. He wrote The Excellencie of a Free-State during his second period as a Commonwealthsman, after a stint as a Royalist propagandist. In it he argued that the end of government being the good of the people, the people ought to govern themselves, because “they best know where the shooe pinches” (p. 25). Therefore, he advocated a unicameral government by a representative popular assembly. As a conservative, someone like me might wonder whether Nedham’s claim is strictly true. Do the people always best know where the shoe pinches? And are they necessarily best placed to know how to what's causing it and how to fix it? After all, not every wearer of a shoe is a shoemaker. It is a perennial theme of conservative jeremiads that “the people” (or “the mob”) are fickle and turbulent. Hence the need for a form of energetic government with a strongly concentrated sovereignty. For many centuries monarchy was that form of government. It is perhaps hard for us now to understand the monarchist mindset, and we are surprised when we see atavistic manifestations of it in the form of broad popular support for a Putin, a Duterte, or a Trump. But most of the people who have ever existed, have lived and died under the rule of monarchs. With this in mind, we might be a little more charitable when approaching thinkers such as Filmer, for whom monarchy was natural in the strongest sense. COTTON, Sir Robert. The Antiquity and Dignity of Parliaments (1679). Reprinted in The Harleian Miscellany, Vol. VIII, pp. 216-228. London: Robert Dutton, 1810. FILMER, Sir Robert. Patriarcha and Other Writings. Johann P. Sommerville (ed.). Cambridge: Cambridge University Press, 1996. HALE, Sir Matthew. The Prerogatives of the King. D. E. C. Yale (ed.). London: Selden Society, 1976. HATSELL, John. Precedents of Proceedings in the House of Commons (4 vols.). London: Luke Hansard, 1818. HILL, Christopher. Review of Patriarcha and Other Political Works of Sir Robert Filmer (Laslett, ed.). History 37.130 (1952), 166. HUNTON, Philip. A Treatise of Monarchy. Reprinted in The Harleian Miscellany, Vol. IX, pp. 321-371. London: Robert Dutton, 1810. LOCKE, John. Two Treatises of Government. Peter Laslett (ed.). Cambridge: Cambridge University Press, 1988. NEDHAM, Marchamont. The Excellencie of a Free-State. Blair Worden (ed.). Indianapolis: Liberty Fund, 2011. SIDNEY, Algernon. Discourses concerning Government. Thomas G. West (ed.). Indianapolis: Liberty Fund, 1996. TYRELL, James. Patriarcha non Monarcha: The Patriarch Unmonarch’d. London: Richard Janeway, 1681.